Unless you’re Indonesian or Malay, you might think only vegans and health nuts eat tempeh. That would be sad. Tempeh is not supposed to be some overpriced block of hippie meat. It’s a traditional and tasty ingredient used in Malay and Indonesian cooking. Tofu is made from coagulated soy milk curd that is pressed into cakes; tempeh is made with fermented whole soybeans pressed into cakes. Tempeh can take more of a beating than tofu, and remains nutty and firm whether it is fried or stewed in a curry. Those who don’t like tofu’s silkiness might appreciate tempeh’s perennially al dente texture. 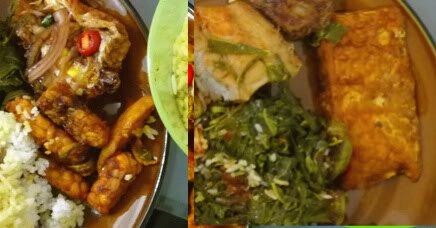 On the left you see tempeh cut into rectangles and fried up with potatoes, ikan bilis, and sambal. On the right you see a large tempeh cake, simply pan fried. Like all good things in life, tempeh is fermented. It’s started by a mould similar to the ones present in those sumptuous mould-ripened cheeses we all know and love. Lactic acid bacteria results from the fermentation of soybeans in tempeh, and has been isolated and studied for its biopreservation features. Consider tempeh a food for fermentation nuts, such as lovers of beer and wine. Although uncooked tempeh has the potentially unsettling appearance of a blue cheese because of its lactic acid bacterial veins, the flavor is surprisingly not sour or tart or even that intense. Tempeh’s main features are its firm, dense texture, and distinct umami–a sort of mushroomy, earthy, nutty savoriness. I don’t believe you can make tempeh taste bad, but Malaysians and Indonesians know better than anyone how to make tempeh taste good. I’ll go so far as to say I crave tempeh when it’s not around. Living in Malaysia, I never have to worry about getting my fix. Freshly made tempeh, still warm, is available for about $0.50 per block. A far cry from Whole Foods. You can get a nice crunch on tempeh if you use a high heat and some peanut oil. One of the simplest methods of preparing crunchy tempeh as a side dish or snack is to pan fry it with chili, garlic, and soya sauce. Add ikan bilis if you have access. Here is a recipe that looks great to me. Tempeh works well in a wet curry too, like ones with a coconut milk base. If you happen to be in Vancouver and want to try tempeh in a Western hippie format, The Naam has been known to make a satisfying and surprisingly tasty vegetarian Ruben sandwich with tempeh. Finally, if you’re keen on making your own and have access to the starter culture here’s how to make tempeh. If you make your own, though, I absolutely insist that you post back with your results! *note: this post previously appeared in our blog A Single Step. Next Post The Best Way to Overcome Writer’s Block? Stop Believing In It.